I am super excited and tremendously honored to once again be invited to create a mural for the BC Children’s Hospital – this time for their Sunny Hill location – a facility that focuses on the treatment and rehabilitation of children learning how to live with a condition that affects their development. I am a firm believer in the power of healing art and witnessed first hand the impact it can have when we were in the hospital with our own daughter shortly after she was born. Artwork in healing spaces engages and comforts children, youth, families and staff. It provides subtle distraction, calms nerves and improves the physical environment of the hospital. The mural I have been asked to create will be for a Procedure Room in Acute Rehabilitation – a space used for children with autism and brain injury and in need of some calming and low-distraction art. I will create two concepts for the space – one with the soothing pink and purple tones of pre-sunset in the Pasley Islands and another with the fading blue mountains and sparkling sunlit water of Howe Sound. Both will be very simple, with calm colours and smooth lines. I want to capture the tranquility of the places around Bowen Island and resonate that feeling to the kids and their families. “As the only children’s rehabilitation facility of its kind in the province, every year thousands of children and their families from 250 communities across BC walk through Sunny Hill’s doors seeking assessments, diagnoses and rehabilitation for a wide range of conditions affecting their development. But above all, they seek hope. 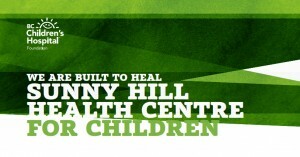 Sunny Hill is there when a child is born with or develops a condition such as cerebral palsy or autism. It is also there for the families who never thought they would need Sunny Hill’s expertise, until the day their child is in a car accident or has an unexpected stroke while on the playground. Sunny Hill is often the next step in the health care journey for children and their families once their acute medical issues are cared for at BC Children’s Hospital. Therefore, kids at Sunny Hill are often not “sick” in the traditional sense of the word, but rather they are learning or re-learning how to communicate, walk and live their lives to their fullest potential.